Tendencies for the assertion or recovery of self-identity have become stronger over the past decades and recently are gaining importance in East Asia and other regions. By drawing distinctive lines of demarcation vis-à-vis the so-called “West” while at the time relying on “Western” concepts and argumentative strategies, a considerable number of public debates can be identified that strongly demand indigenous “values,” own ways of thinking and behavior as formative factors for policy, economy, culture, and education. 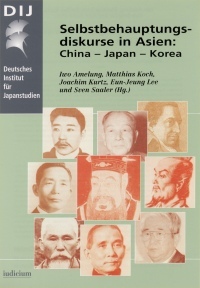 It has been the aim of several symposiums organized by the School of Human Sciences/Comparative Cultural Sciences at Osaka University, the Department of Middle Eastern and Far Eastern Languages and Cultures/Chinese Studies at Friedrich-Alexander University Erlangen-Nuremberg, and the German Institute for Japanese Studies (DIJ) to initiate interdisciplinary research on the complex phenomenon of discourses of self-assertion. This volume presents a selection of contributions from symposiums held in 2000 and 2001 in Tokyo and Seoul. Geschichtsschulbücher als Medium neonationalistischer Identitätskonstruktion: Der Fall "Tsukuru-kai"